Ok, pals, I'm in my home town, more or less. Actually I'm staying in Oceanside, on the Marine base, but I grew up in Pt. Loma. Today we went to the beach, where I took off my Tevas and socks and walked barefoot in the sand. Water temp 58, air 52. LOTS of surfers out there today, as the surf is up pretty high right now. I saw more female surfers this time than usual. Go girl surfers!! It's nice to be home, where no one will look at you funny for wearing Tevas with socks, nor anything else you might want to wear, or not wear. A woman about my age or older had rented a surfboard and was on the beach, sort of struggling with it. I went over to talk to her. She said she had rented a boogie board the day before, but today she was going out with the big guys. She got about 20 feet out there with that big heavy foam tourist board, and gave up. I went back to try to explain how to get out past the breakers with the board, but I realized she was pretty clueless about dealing with the surf. And the surf was way too big for a grommet (newbie), anyway. Then she told me she was going to try body surfing. She had no fins, so I figured that was not going to happen. She didn't seem to have a clue about it anyway. I felt badly I couldn't help her a little more, but I had no wetsuit, it was cold, there was the problem of no fins, etc. It just wasn't the day for it. Besides, you don't body surf with the board surfers. I have tried to teach people to body surf before, but if they have not swum in surf before, they need to first get comfortable with that function. You have to be comfortable with diving under the waves, etc. I had my first surf air mattress (a short, durable air mattress made for little kids to catch waves) when I was about 7, and could catch waves like crazy with that thing. That was before boogie boards were invented. After lunch, my younger son, (the one who's not a Marine), and I rode our bikes off the base and onto the bike path that runs from Oceanside to Fallbrook along the San Luis Rey River. We rode about 12 miles. It was a pain in the neck getting back on base, since the MPs wouldn't let us through the gate we had come out of, so we had to ride up to the main gate through a whole bunch of traffic, and then my son didn't have a helmet, so he had to walk his bike once we got back onto the base. The MP at the gate said, sternly, "If we catch you riding without a helmet, we'll throw you off the base!" Yeah, riding without a helmet--that would be a real breach of Homeland Security, now wouldn't it? I really enjoy all the plants out here on the coast. More on plants later. Saw some neat birds, too: Pelicans, especially. I forgot the cord to the camera! I'm beat. I just rode 17 miles of dirt, up the Santa Margarita River, and back down to the beach--all on Camp Pendleton. Pendleton is like California before the developers discovered it. No houses on the beach, just a tomato field and a dirt road! I did this ride with my two sons who are both in their mid-20s. Despite my danged disc brakes dragging, which we stopped to try to fix several times (one of my sons is a pretty good bike mechanic) they still did drag a little, but I did okay until toward the end of the ride I began to lag quite a bit. Since the bike hadn't been rolling right the whole time it really wore me out. Plus I haven't been doing much in the way of serious rides lately since it is too cold at home. I know, I know--excuses, excuses! It rained this morning, washing away the smog, and it turned out to be a gorgeous day, sunny, breezy, with puffy white clouds. The ocean is blown to bits with the wind, but maybe after it calms down a bit the surfers will be happy, because the waves are still pretty big. I talked to someone up in Eagar. She said it's snowing there! I sort of got busy and didn't finish this. On Wednesday, I think it was, we went to Valley Center, a small rural community about 15 miles north of Escondido. 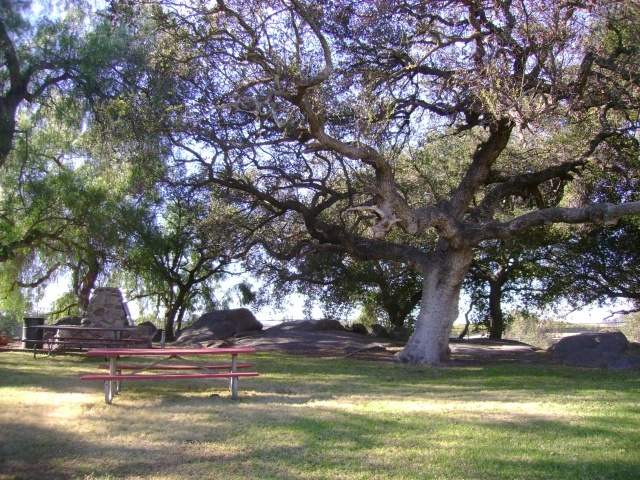 When I was growing up my family used to picnic at a certain old oak tree near the Valley Center school. There was a picnic table and a swingset and a stone barbecue. I wanted to find that place, but I had been warned by my brother that it is all different now. Before, there was chaparral brush, no grass, long views of ranchlands and Palomar Mtn. and the little country school nearby. Now, all that has been altered. We found the school on Cole Grade Rd. There was a driveway right about where I thought there should be one to get to the oak tree. But now there is a swimming pool, several tennis courts, a big paved parking lot, restrooms, lawns, lots of planted non-native trees, and the school district administrative offices, all on the side of that hill, and the school bus yard at the bottom of the hill. I almost despaired of finding the old oak tree. I hiked all over that hill, and I finally did find it, still with a picnic table under it, and the old stone barbecue nearby! That old tree and the barbecue are the only things left that I remember. We have family movies of me when I was about 3 at that place (54 years ago). But that old tree looks healthy, despite being crowded by pepper trees, and pines, and other trees that have been planted. Under the oak tree are boulders with Indian grinding holes in them where the Indians used to grind the acorns hundreds of years ago. My son climbed up high in the tree, and the rest of the family trickled over to the area, and we set up our picnic on the table with crackers and sausage and cheese, just like my mom would have done so many years ago. I remember my dad would lie on a blanket under the tree, in its shade, and read a book. And he would stare up at the sky, and tell me, "I'm making the clouds disappear." He would tell me that if you pick a very small cloud and you stare at it and concentrate, it will disappear! I would try it and by golly, he was right! We always had a great big car with a huge trunk in those days--a Caddy or a Buick, and my mother would put all the picnic things and the picnic blanket in the trunk. And we would take off and go out of the city and up to the mountains. We did this often, sometimes every weekend. We had other favorite places to go, but the old oak tree was always special. I am very glad I got to share this place with my family. We had a very pleasant time at the old oak tree. Yeah, well those are on my laptop. And last time I tried to get into the gallery, it wouldn't open for me. That seems to happen a lot on this site. Ok, so I will get those photos up later on. I should put them on Facebook, too. I can't figure out how to do images with this google chrome setup. It's very frustrating. But I did put the photos in the gallery. I wanted to put one on here but it doesn't work any more. Thanks fior sharing -- Classic! & a great picture to boot! Thanks!! There are more in the gallery. I do intend to finish the blog. Maybe will write about another day this evening, and post more of the photos. I so enjoyed your old oak tree story and the picture is indeed awesome! Thank you! That is a beautiful Oak tree Elizabeth. Wow ! And the Happy memories to go with it .... nice !